Ball cap, adjustable strap. 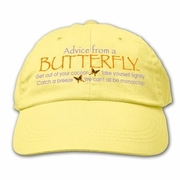 Advice from a Butterfly. Get out of your cocoon / Take yourself lightly / Catch a breeze / We can't all be monarchs!